The client is a serial entrepreneur and trader, managing several corporate accounts with our partner the LMAX Exchange. He was originally a client of our MT4 development services, and as he was scaling up in term of capital he was consequently becoming more and more sensitive to quality execution and transaction costs, which bring him back to us to discuss how we could improve his execution. Lower his transaction costs (from commissions to slippages). Be able to run a trade centric strategies (like in MT4). Be able to manage several accounts on same platform in order to decrease the complexity of his set up and the required amount of technical maintenance work. Since AlphaTrader 2.5, it is possible to connect multiple accounts to the same instance of AlphaTrader, our algorithmic trading platform specialised on quality execution. So it was for us a perfect match and we naturally proposed a solution based on AlphaTrader. Req1: Lower his transaction costs. At Alpha Novae we always put the highest priority in providing the best execution and lowering transaction costs of our clients. You can find detailled explanation on how AlphaTrader can reduce your transaction costs here. A clear distinction is made between (FIFO) Position Centric platforms where hedging (being long and short) on the same instrument is not possible, and (non FIFO) Trade Centric platform where it is possible to have different long/short trades on the same instrument with different stop loss and take profit. From experience we know that traders have their habits and their way to think the algorithms. It is difficult to think in a Position centric way when you have been working for years in a Trade centric way. 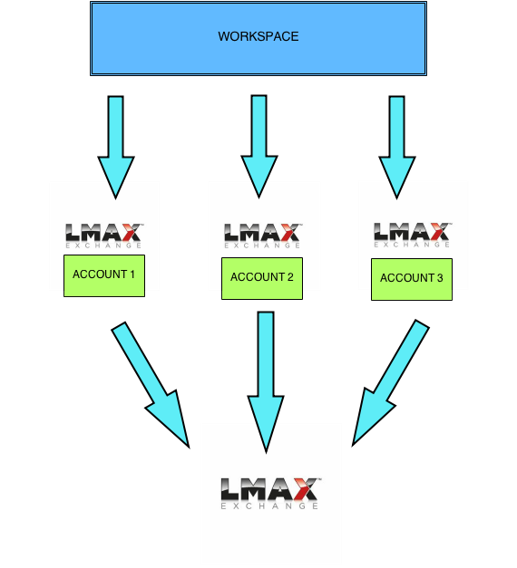 But is not only about habits and being lazy to change… Let’s take the example of several strategies running in parallel for example on the LMAX Exchange. How can we have two strategies being long for one with a specific stop loss and take profit, and short for the other with different associated stop loss and take profit? In a FIFO position centric environment it is not possible. You are flat you can not associate stop loss or take profits to a flat position. Same problem if your strategy A is long 2 lots and Strategy B is short 1 lot. Your net position is long 1 lot and you can not associate to the short trade a specific stop loss or take profit. The advantage of Trade Centric platform is to allow this kind of “hedging” and consequently all kind or combinations of trading strategies… while the advantage of Position Centric platform is to net positions and consequently reducing the financing costs (cf overnight/financing costs above on reason 1). AlphaTrader is proud to be a platform allowing both Trade Centric and Position Centric trading. Thanks to its Virtual Order Manager layer AlphaTrader can even emulate a Trade Centric environment with a FIFO venue such as the LMAX Exchange, allowing you to have the advantage of the position centric trading (smaller fees thanks to position netting) keeping the liberty of hedging in a Trade Centric environment. As a consequence, any trading algorithms from any platform can be translated and imported into AlphaTrader, especially MT4 trade centric EAs. Starting with AlphaTrader 2.5, it is now possible to connect multiple accounts and brokers on the same AlphaTrader platform. Accounts are being configured on the same AlphaTrader workspace. 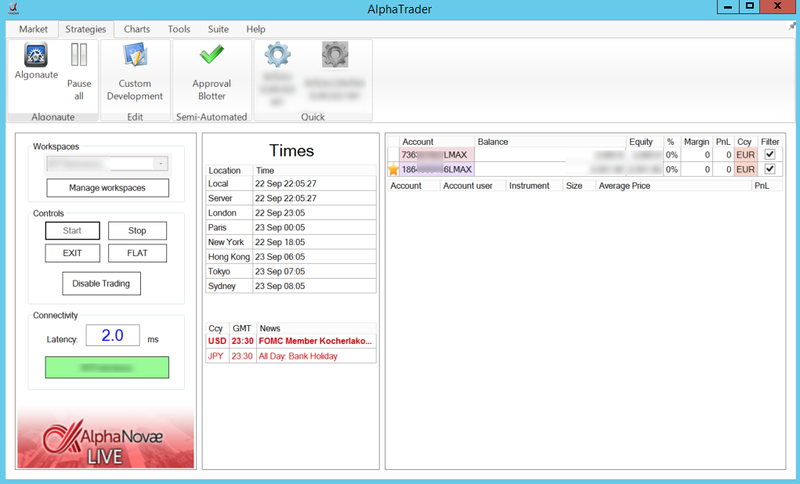 AlphaTrader connects for each account to the specific trade, account, position and commission connexion. 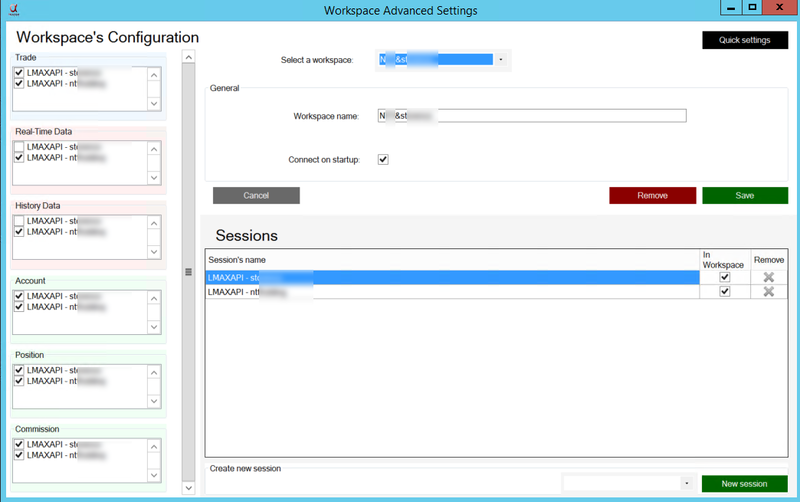 But we only implement in the workspace one connexion for real time and historical data. Indeed, it is useless to get duplicated market data feed for the same broker! You can see on the below image a setup of AlphaTrader with two accounts. Latency is not impacted as on the client set up, roundtrip heartbeat latency with the LMAX Exchange is of 2 ms. The account flagged by a staris the default account. When you open an order entry panel (scalper, DOM, chart) or add a strategy, the account will be set by default on your account flagged by the star. But you can of course change it to one of your other accounts. Then when adding each strategies into AlgoNaute, it is possible to select the account as a parameter of the strategy. The blotter (trade or positions), the execution history panel, the trade history panels, etc, gives you the possibility to browse all the trade or fills for all accounts or to select an individual one. AlphaTrader AlphaAPI allows strategies to start and stop and more broadly, to pilot, other strategies. For example, a master strategy can decide to run different strategies depending market conditions or strategies PnL. Also slave strategies could “listen” master strategy orders and take configurable position alongside master or not depending different scenario. So it was possible to implement his ideas without problems. As a first stage of the project, we migrated the client strategies from MT4 into AlphaTrader and we went live successfully with one account. This proof of concept period being successful, the client decided to migrated his other accounts progressively from MT4 to AlphaTrader. The client was now able to manage all his accounts in only one trading platform and benefits of a tier-I execution performance. A few months later, the client asked us to develop his master and slave strategies system, the master strategy starting and stopping slave strategies depending different rules. Then after an other 6 months period of live trading, with all his systems running on several accounts, the client scaled up from executing less than 5 millions dollars per month to executing now more than 250 millions dollars per month. The client scaled up again and his corporate entity composed of three partners now, is executing more than one yard (billion) per month with more than 1000 trades per day and a FIX connectivity. More importantly, their accounts are in profit of more than 30%.